This 11-day South Island road trip begins in Queenstown, the crown jewel of kiwi mountain biking and ends in the spectacular sunshine capital, Nelson, located on the northern tip of the South Island. In between you’ll ride and visit a mind-boggling array of diverse riding regions including Wanaka, Alexandra & Clyde, the Reefton Tracks, Craigieburn and the awesome seaside Marlborough Sounds. Featuring a boat shuttle, a helicopter drop, a visit to Mount Cook National Park and 10-days of spectacular single-track riding led by professional local leaders; if you’ve dreamt of the ultimate New Zealand trip wait no longer. Items of a personal nature e.g. phone, internet, beverages etc. There’s a reason why rider’s from around the world aim to ride in New Zealand someday. Its stunning scenery and mesmerising back drops make it one of the world’s most beautiful countries. 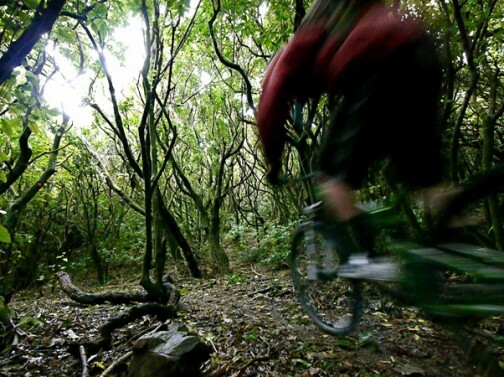 This mountain biking adventure boasts the very best on offer in New Zealand and covers some of the best all mountain trails available: Queenstown, Wanaka, Craigieburn, The West Coast, Nelson and The Marlborough Sounds. Mix these world class trails with professional local guides, a helicopter, a boat, some local seafood and beer you can start to imagine why this is a New Zealand trip of a lifetime! The technical ability required for Silver Fern is rated as Level II and higher. In other words, the trails are technical at times and even though this is an all-mountain trip there is an emphasis on gravity riding. Please call us to further clarify the technical ability needed. For fitness level, this trip is a Level II and higher. Expect four to six hours on your bike daily over nine consecutive days of riding. The fitter you are the more fun you’ll have! This trip is demanding at times as we ride daily and travel quite often, but the rewards are fantastic. The perfect bike for this trip is a 5 or 6-inch all-mountain dual suspension with disk brakes. All participants are required to have their bikes in excellent working order before the trip begins. We will send you a detailed list of required equipment and clothing before departure. This trip has been designed to showcase accommodation that captures the true experience of New Zealand. Expect unique properties – from private lodges in spectacular settings, to hotels and mountain huts. We’ll eat very well in New Zealand. Please let us know if you have any dietary needs. In mountains, weather can change quickly and drastically – it could be 30 degrees Celsius one day and then freezing on a mountain top the next day. We need to be prepared for a wide range of weather. The average high temperature in Queenstown in February is 22 Degrees Celsius, average low is 10 Degrees Celsius. Our trips take place in remote regions with limited evacuation options available and there are always risks and hazards on the trails that we ride. If you choose to participate in this trip, it is up to you to ride well within your limits, to ride conservatively and to be safe as mountain biking is a dangerous sport. Participants must keep their bikes in good working condition, they must be hydrated and rested and alcohol and drugs are not permitted while riding. Your guides have basic first aid training and if a serious injury is suspected they will call helicopter search and rescue at the cost of the participant. Personal medical travel insurance is mandatory. Cancellation Fees for this trip is as follows: 90+ days prior to your trip: a charge of $150/46-90 days prior to your trip: a charge of $750/0-45 days prior to your trip: a charge of 100% of the total cost of the trip. Arrive in beautiful Queenstown to be greeted by your guide and transfer to your hotel. Flights are required to arrive in the morning- or if possible, we suggest arriving a day (or two) early to rest up for the adventure ahead. After building up our bikes, we’ll head out on a warm-up spin on the legendary trail network, 7-Mile. This evening we head out on the vintage TSS Earnslaw Steamship for a dinner cruise on spectacular Lake Wakatipu. Tonight we stay at a mountain chalet on Coronet Peak! Wake up high on the mountain with single-track from the door! Drop in after breakfast on Rude Rock, a series of sweet single-track trails accessible by shuttle. We’ll lap up this riding paradise until mid-afternoon and then head off to Lake Hayes for a swim and one-hour transfer to Wanaka. Dinner is at the historic Cardrona Pub and we’ll bed down at the stunning Lookout Lodge. Start the day off with a killer 12-kilometre loop on the epic Dean’s Bank trail. Then we hop in the helicopter to land on the summit of Mt. Pisa, 2000 M (6000 feet) for an amazing 1800M descent. After this amazing day we’re back at the Lookout Lodge. This morning it’s a one-hour transfer to Alexandra, a picturesque town located in a semi-arid valley with tons of great buffed single-track. Our morning will be spent riding Alexandra and afternoon riding Clyde. Then we load up into a 4X4 and drive up the Lindis Pass to a private mountain hut, the Lindis Hut, to settle down for the night. Wake up to the smell of hot cooked breakfast lofting through this idyllic mountain hut. After breakfast we’ll jump on the bike for a great downhill ride with stunning scenery in a vast and beautiful landscape. Then it’s back in the van for a two-hour transfer to Lake Tekapo. On route we’ll stop in for a visit spectacular Mount Cook National Park located at the base of NZ’s highest peak, Mount Cook. Tonight we sleep at the Lake Tekapo motel. This morning we drive two-hours into a remote part of the South Island. Craigieburn is a hidden mountain biking gem in NZ. It seems to be one of those places that’s on the list of so many riders but few seem to make to journey deep into the Canterbury mountains to experience it. This afternoon we’ll ride through native forest and subalpine terrain on perfect all-mountain trails. Tonight we sleep in a private house. A deserved mellow day today, if you choose. No transfers just riding bikes in one of New Zealand’s cherished riding regions. Today you can choose to take part of the day off the bike, or you can ride to your heart’s content. Your call. Another night in a private house. Load the van this morning and drive four-hours through the mountains to the little town of Reefton, nestled on the edge of the spectacular West Coast. No time to waste as we’ll suit up to ride the awesome Reefton tracks in the Waitahu Valley. Tonight we sleep at the beautiful Murchison Lodge. A spectacular two-hour drive will take us to New Zealand’s self-professed Sunshine Capital, Nelson; a beautiful town surrounded by the ocean, islands and mountains. There are many riding options in this veritable paradise. After lunch we gauge how the group is feeling and we’ll tailor the ride to suit your riding desires. Dinner at the local brewery, The Free House and a deserved swim and sleep at The Palms Motel. Rise ‘n shine, it’s time to ride one of NZ’s highly regarded single-track trails, ‘The Queen Charlotte’ located in the sweeping Marlborough Sound. The actual length of the trail is 80 km, the longest in NZ, today we’ll ride approximately 20 kilometres of it. You can expect some challenging climbs and fast descents with stunning sea views. We’ll transfer 1.5 hours each way today to access the boat launch in Picton. We’re back at The Palms Motel tonight. Today we will transfer you to Christchurch for your flights home.